Women in Horror Month rolls around every February and with it every year, we have the opportunity to showcase women in horror and encourage other women to participate. For more information on events held throughout the United States and internationally, please check out the website and the official Women in Horror Month blog, Ax Wound. To celebrate, I’ve made a list of some of my favorite women in horror. I feel that often people who write about women in horror just focus on women who choose to direct horror films, so I have chosen to include writers, podcasters and other women who have made their marks on the horror industry. Your favorite big-screen female serial killer and film critic was excluded, of course. For her portrayal of agent Clarice Starling, I had to include her on the list. I started to fall in love with horror when I saw The Silence of the Lambs. I realized women could be the leads of films and not just in romantic comedies. Starling solves the case and actually cares about the victims, too, unlike her male counterparts. She isn’t some hapless damsel in distress, but neither is she some unrealistic portrayal of a woman with impossible body strength or physical capabilities. She was someone I could identify with, someone I could pretend was me up there on the screen. Women everywhere are lauding Wonder Woman as a feminist triumph, but horror movies have been using women as capable hero problem-solvers of some pretty sticky situations for quite some time. Jodie Foster’s portrayal of a woman who is going to get the job done, no matter what, was near perfect. 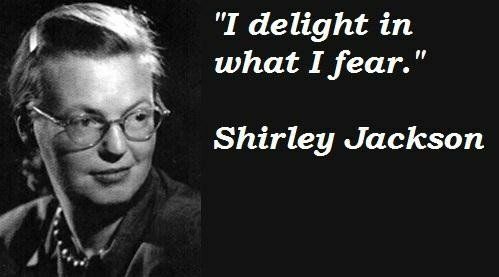 There aren’t that many female screenwriters and even fewer of them have written horror, but one that easily comes to mind is the great Shirley Jackson. People like Stephen King and Neil Gaiman have all cited her as an inspiration. In case you didn’t know, she was the writer behind The Haunting of Hill House and the often replicated short, The Lottery. In 1948, she was often criticized as neurotic, a common put-down given to women who perhaps felt a bit too much of the world around them. Her husband, however, was quite offended by the idea and would state that her works were really quite reflections on society. Any fan of horror knows that is actually the point of most horror: It’s not the story, but the implication of what that story means about society. Jackson took pleasure in having her works banned, as she often felt people who banned her works truly understood her meanings. If you haven’t seen The Haunting, I suggest you go stream it now. Never heard of Ann, you say? Oh, she is just the mother of Gothic horror. Before Ann, Gothic horror was not considered respectable and her ability to write and explain supernatural events brought the genre to the front of works at the time. Radcliffe’s fiction is marked by seemingly supernatural events that are then provided with rational explanations. Some modern critics have been frustrated by her works, as she fails to include “real ghosts.” Basically, her books had the “Scooby Doo effect” type of storylines, except more romantic. In her books, she values rationalism and realism over fantastical explanations for paranormal events. More importantly, the rights of women are advocated and reason prevails in all of her novels. Here is a little tidbit for you: She was the highest paid author of her time — no easy feat for a woman back then. If you’d like to read some of her work, I suggest The Italian. It’s a dark novel dealing with the holy inquisition. If you don’t know who Mary Harron is, I need you to go watch American Psycho now. American Psycho is a complex film that is still relevant to audiences today, long after the yuppie-filled ’80s have past. I don’t think a man could have made the film quite as sharply as a female. That may seem odd, but perhaps the “female gaze” was exactly what this film needed to stay as razor sharp as the book. The film is all about modern male vanity and sometimes it can be hard for us to truly see ourselves for what we are. Harron was able to go deep and never fall in love with he antihero. Nope, she shows the audience just how detached from reality and how absentmindedly masochistic the character actually is. She rips the Band-Aid off to look at the gaping hole and it doesn’t hurt her the way it would perhaps hurt a male director. Could this film have been made by a male director… not and be the same movie, no. Known for their podcast Faculty of Horror, these two ladies take a journalistic approach to critiquing classic and contemporary horror films. Andrea Subissati has published When There’s No More Room In Hell: The Sociology of the Living Dead and she is also a writer for Rue Morgue. Alexandra’s first book, Films of New French Extremity: Visceral Horror and National Identity, is available through McFarland. Her upcoming book, The 1990s Teen Horror Cycle: Final Girls and New Hollywood Formula, is also available via McFarland for pre-order. The pair is very popular in the horror world and occasionally they’ll hit a con here or there. Most importantly, they are horror scholars and they know their stuff. If you are looking for a podcast with a different point of view than the normal guy in his basement, take a listen to these two female horror scholars. So, what makes them stand out from their male counterparts? Easy. They are actually educated on the subject. Who knew that was even a thing one could choose to study in college? Anyone you love that I left out? Feel free to let us know who your favorite women in horror are in the comments.